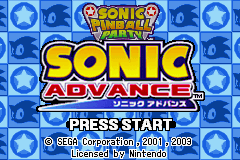 2 Games in 1: Sonic Advance & Sonic Pinball Party (known as Sonic Advance & Sonic Pinball Party Combo Pack in America) is a compilation of two Sonic games for the Game Boy Advance. It contains the games Sonic Advance and Sonic Pinball Party. There are no extras, just a menu that lets you select the two games. Of the six games in the "2 Games in 1" GBA compilation series this is the only one chosen for release in the United States. On emulation websites, the European ROM is being labeled as "2 In 1 Sonic Pack Vol 1". In the US, the game is called Combo Pack: Sonic Advance + Sonic Pinball Party, and Nintendo of America's website calls it Dual Pack: Sonic Advance & Sonic Pinball Party. Both games contain a separate Tiny Chao Garden. This page was last edited on 16 February 2019, at 22:35.